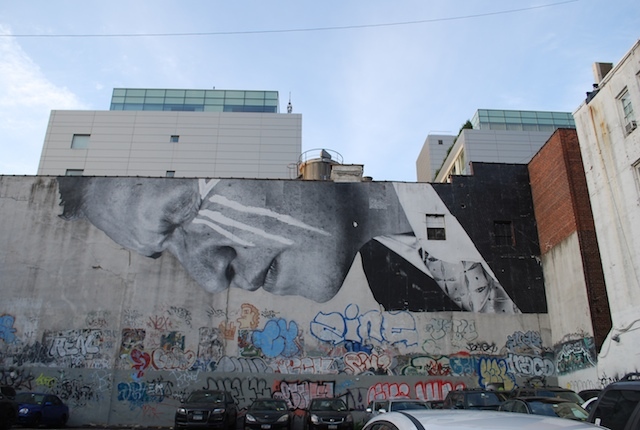 One of my favourite artists, JR, was in New York some time ago, and pasted up some images from the ‘Lakota, Dakota Nation’ project that is part of Inside Out, the global, participatory enterprise launched by JR after winning the TED prize last year. I’m a big fan of JR’s work and have recently been writing about it in my academic work, so it’s always a pleasure to see his images on display in a city. 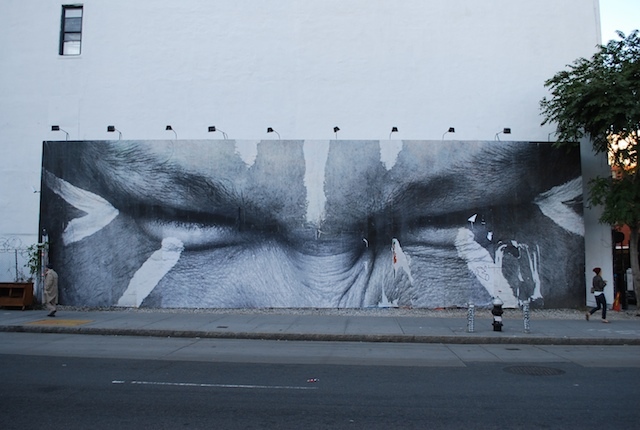 Hugely striking, not just for their close-up intimacy, as characterises all of JR’s work, but also, especially in the second of those two pieces, for their placement. For that face to run on its side along the top of the building was a counter-intuitive decision that works really well. This image works really well in this setting: the black and white photography stands out against the urban background, the shape of the section of face that is featured seems to fit the space of the wall particularly well. 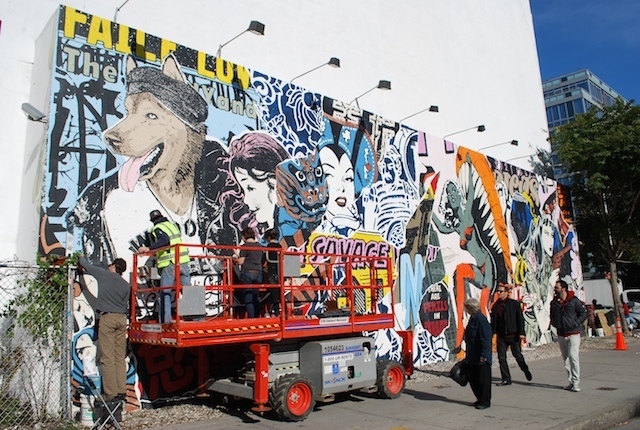 It was lucky that I photographed it when I did, because unbeknownst to me that wall was about to be transformed. 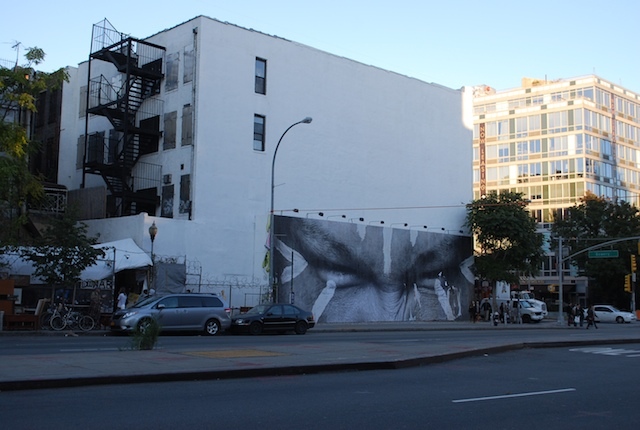 Within two days, JR was gone and Faile were putting up a very different image, involving stand-out colouration, images from pop culture, fragments of text, and collaged figures, as has become their signature. 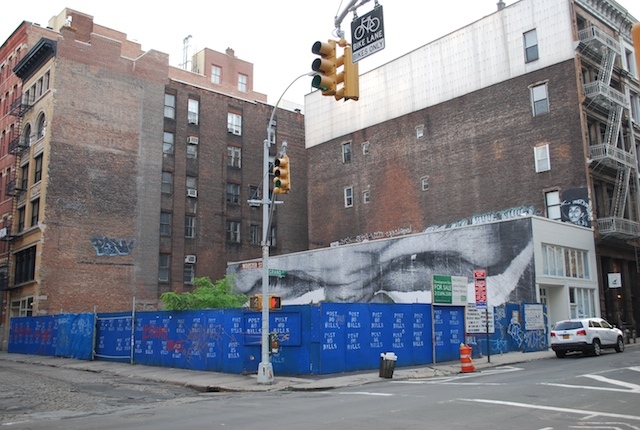 The wall at East Houston and Bowery works so well because its size, shape and location next to the plain white wall of a building mean that large-scale portraits such as JR’s work beautifully, but also busy, flattened, pop images like Faile’s also seem to draw energy from the location. 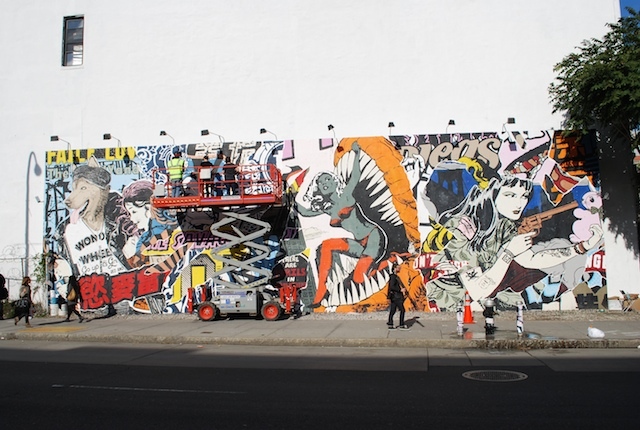 When I went by to see it, Faile were putting the finishing touches to it, and there were many happy passers-by like myself taking photographs, including the legend herself, Martha Cooper.